UPDATED: In a 6-1 vote Monday, the House Select Committee on Transparency in State Agency Operations voted to censure University of Texas System Regent Wallace Hall. The committee’s investigation of Hall, who was first appointed to the post in 2011, has focused in particular on his lengthy personal investigations of the University of Texas at Austin administration and his subsequent handling of private student information. Hall has denied accusations of wrongdoing, saying his efforts have satisfied the oversight responsibilities of his position. Some of his findings, including his allegations that the flagship university is subject to undue political influence in its admissions processes, have led to formal inquiries and policy changes. In a statement, Hall said, "The committee's findings are based on distortions, untruths, and intentional misrepresentations." The regent accused the committee and Speaker Joe Straus, R-San Antonio, who charged the panel with conducting the investigation, of having "abused the public's trust and money to cover up their improper interference in System operations, including to defend a university president who was repeatedly asked to leave." Last month, under pressure from system officials, UT-Austin President Bill Powers, the target of much of Hall's own investigative efforts, submitted his resignation, which won't take effect until June 2, 2015. In a statement of his own, Straus thanked the committee for its work on this investigation, which has lasted more than a year. "Today's vote sends a clear message," he said. "The Legislature encourages regents and other executive appointees to ask difficult questions of the agencies in their care. But when appointees' actions begin to harm those agencies — as Regent Hall's repeatedly have — the Texas House will not ignore its own oversight role." In comments made to reporters, committee co-chairman Dan Flynn, R-Van, stressed the historic nature of the vote to censure a sitting regent, which to his knowledge had never been done before. State Rep. Charles Perry, R-Lubbock, was the lone dissenting vote. Co-chairwoman Carol Alvarado, D-Houston, said that if there were new developments, approving articles of impeachment in the future remains on option. “A vote to censure is not a vote against impeachment,” she said. The committee’s next meeting, on Oct. 6, is expected to mostly focus on matters unrelated to UT. But the co-chairs insisted that they would keep an eye on UT. Committee members Lyle Larson, R-San Antonio, and Trey Martinez Fischer, D-San Antonio, have been assigned the task of continuing to monitor the situation. Meanwhile, multiple investigations that have resulted from Hall’s activities remain ongoing. The UT System announced Monday that it has hired Kroll Associates, an investigative firm with offices in Bastrop and Dallas, to examine admissions practices at UT-Austin. In its contract with the company, the system agreed to spend up to $145,000 on the investigation. This year, the legislative committee referred legal questions about Hall’s handling of private student information to Travis County prosecutors, who opened a criminal investigation. In a letter sent Monday to fellow members of the Texas House Republican Caucus, Flynn wrote that “it is understood the committee should be receiving feedback soon” from Travis County officials. In his letter, Flynn expressed particular frustration at Hall’s refusal to cooperate with the committee by accepting its invitations to testifying or to suggest witnesses. Hall, in his statement, faulted the committee for not compelling his testimony. "If committee members wanted the truth about abuses in the UT System," the regent said, "they would have provided a subpoena that would enable me to answer their questions fully. Instead, they chose to not subpoena me so I could not answer the only questions that matter." In the motion approved on Monday, the committee recommended that the UT System pick up the tab for its investigation. The legal fees for Rusty Hardin, the Houston-based attorney who served as the committee's special counsel, totaled $500,000. The recommendation specifies that the money "not be borne by the students or employees of the system, not be passed on to any component institution, and not affect in any way the quality of teaching, research or student life." Rather, it is the members' intention that the funds come of the operating budgets of the system office or the board of regents. The system has already been billed more than $300,000 by outside attorneys who were hired to assist them during the committee's inquiry. UT System Board Chairman Paul Foster took issue with the proposal to stick the system with the bill and with committee's plans for ongoing monitoring. In a statement, he said that the board does not believe "that the extraordinary and unprecedented degree of legislative oversight set forth in the motion is justified or necessary." "Nor do we believe it appropriate or fair," he continued, "that the costs of the work of the Select Committee, authorized by the House of Representatives alone, be imposed on the System." In his statement, Foster strongly disagreed with the committee's findings, particularly the idea, contained in the motion, the board had suffered a loss of "institutional control," a charge he said was "completely erroneous." "While I and others may not always concur with the style and methods employed by Regent Wallace Hall," Foster said, "I will affirm that he has always diligently worked to further what he sees as the best interests of the UT System." Alex Cranberg, a regent who has been supportive of Hall, also issued a statement. "I choose to look at this travesty of transparency in an optimistic fashion," he said. "The incorrect, misleading and disingenuous statements that fill the Censure and Admonishment Motion provide an important opportunity for voters and for fair-minded legislators to hold those that are not so fair-minded accountable. That is the means of our democracy." In a statement of support for Monday's decision to censure Hall, the Texas Coalition for Excellence in Higher Education, a group that was formed in 2011 and has been critical of the regent, said, "Whether appointees serve on a university board of regents or oversee a state agency, Texans deserve to have confidence in their integrity and motivations. 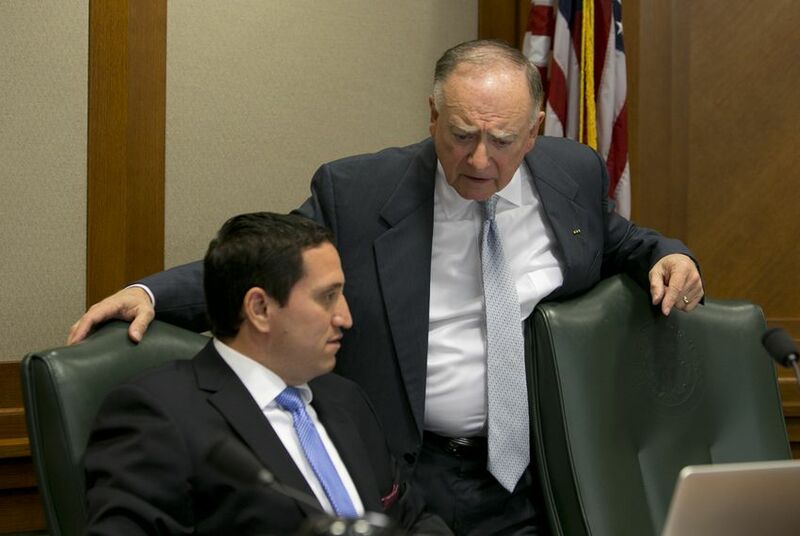 Regent Hall’s actions have shredded that confidence and today’s censure sends an important signal that the Texas Legislature will not stand for abuse of power by political appointees." The House Select Committee on Transparency in State Agency Operations will weigh multiple options on Monday when it meets to seek some closure to an investigation of University of Texas System Regent Wallace Hall that has lasted more than a year. Among the options: voting on articles of impeachment against Hall, waiting on the results of a separate criminal investigation, issuing guidelines for all regents or considering another type of reprimand. "At this point, everything’s on the table," committee co-chair Dan Flynn, R-Van, said on Friday. Hall has been accused of abusing his authority and mishandling private student information in his personal investigations of the administration of the University of Texas at Austin. The regent has denied any wrongdoing and said his efforts have been in line with the oversight responsibilities of his position. He and his attorneys have alleged that, among other things, the university has allowed political influence to creep into its admissions processes. The system has announced an external investigation of the matter. The legislative committee launched an investigation of Hall last summer. Earlier this year, the committee's special counsel, Houston-based attorney Rusty Hardin, issued a report laying out four possible grounds for impeachment of Hall. In a 7-1 vote in May, the committee voted that grounds for impeaching Hall exist. They have since been working on drafting specific articles of impeachment. At the committee's last hearing in July, members expressed an openness to stopping short — for the time being, at least — of approving such articles. Travis County prosecutors are currently conducting an investigation of Hall's handling of student information. While members of the committee indicated a desire to take some sort of action in the near future, some suggested they preferred to wait until that effort has concluded before tabling or approving any articles of impeachment. "We need to step back and take a hard look at issuing a statement, and not necessarily taking impeachment off the table, but allowing that to be something that we might revisit if and when there are criminal indictments," Rep. Four Price, R-Amarillo, said at the July hearing. In his comments, Price took exception to some critics' framing of the inquiry as being merely over a regent asking too many questions. "There’s a right way to ask questions and there’s a wrong way to ask questions," he said. "There’s a right way to express an opinion and there’s a wrong way to do it." Price encouraged his fellow board members to seriously consider issuing "a public reprimand or censure that outlines some of that information and gives not only a statement or a conclusion on some of those issues … but also gives some guidance and sets forth a message that allows [the board] to do [its] job in a productive way going forward." State Rep. Trey Martinez Fischer, D-San Antonio, also said the situation might call for a response that was broader in focus than a single regent. "Maybe a more considerable exercise of this committee should be: Forget articles of impeachment for Wallace Hall, let’s just write the best practice for systems throughout the state," he said. In the July hearing, there was a strong sense that the committee's work on the issue had run its course. Before beginning her questioning of witnesses, state Rep. Naomi Gonzalez, D-El Paso, likened the matter to a dead horse. "It’s dead and I don’t want to make it deader," she said. On Monday, the committee is expected — as it has at all of its hearings — to spend a significant chunk of time behind closed doors in executive session. On Friday, Flynn indicated that he was hopeful that agreement can be reached in that discussion that will allow the group to put the matter of to rest for the time being. "I’m going in with high expectations, but I understand there are still conversations that need to be held," he said. "We’re going to look at it, come out of our discussion and hopefully we can set a date to move on to other issues." Disclosure: The University of Texas at Austin is a corporate sponsor of The Texas Tribune. Rusty Hardin was a major donor to the Tribune in 2012 and 2013. A complete list of Texas Tribune donors and sponsors can be viewed here.